The Dual Fluorescent Protein flashlight is a portable, battery-operated flashlight that includes two different, switch-selectable high intensity LEDs for excitation of fluorescent proteins or other fluorophores, and comes with matching barrier filter glasses and a handy carry/storage case. I’m ready to order – tell me how! What comes with the DFP? What are the part numbers for different color combinations? You can easily screen for two different colored fluorophores with one flashlight. We can provide flashlights containing any two of the excitation colors that are available with our popular Model SFA Stereo Microscope Fluorescence Adapter. For a comprehensive table of fluorophores and recommended NIGHTSEA excitation wavelengths that match, please reference our article on the subject. 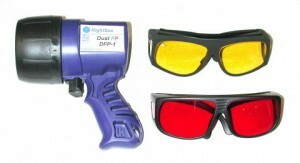 With the DFP light you receive two pairs of barrier filter glasses, a set of batteries, and a convenient storage case. The glasses are well matched to the excitation source so that they block the reflected excitation light while transmitting the fluorescence with high efficiency, providing excellent viewing contrast. What are the part numbers for the different color combinations? NIGHTSEA products for the laboratory are distributed by Electron Microscopy Sciences.